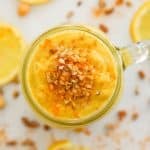 This banana-free, Luscious Lemon Cheesecake Smoothie is the most decadent smoothie I have ever tasted. It is like dessert in a glass & tastes just like lemon cheesecake in thick, amazingly delicious, liquid form. It also happens to be super healthy! Begin by zesting the lemon. Put the zest in the blender then cut the remaining peel and pith (the white stuff) off the lemon. I do this by cutting both of the pointy ends, then I stand the lemon up on the board. Then I use a sharp knife to cut all the way around it just down far enough to remove the pith and leave the flesh intact. Once done throw the whole lemon in the blender and discard the pith and peel. Add all of the other ingredients except the maple syrup. Blend until completely smooth. It makes quite a thick smoothie. If you prefer it a bit thinner you can add a little more coconut milk, or a drop of water to thin it out a bit. Taste a little bit and add the maple syrup if you want a touch more sweetness. I like it with the maple syrup. Blend on low for a second to distribute then pour into a glass and enjoy.